Something about Christmas cookies triggers a flood of memories—and one person’s happy memory makes another’s perfect present. 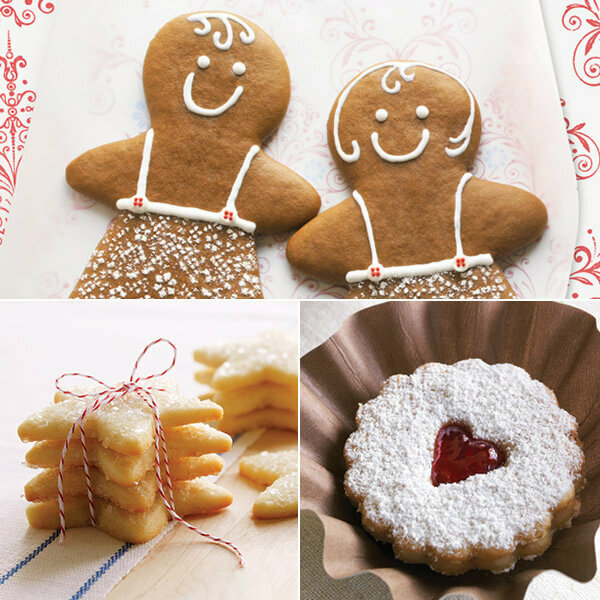 We’ve rounded more than a dozen traditional Christmas cookie recipes that are perfect for making, baking and giving. Whip up a batch of one (or all) of these 15 holiday favorites and give a tinful of tradition and sugary goodness. Good enough to give tip: Secure stacks of sugar cookies with bakery string or pretty ribbon before placing in a container. Good enough to give tip: A glassine envelope sealed with a round office label makes every cookie perfectly presentable. Stamp the label with a festive design for an extra-special touch. Bonus! Recipe includes 4 tasty twists: Hawaiian Lace Cookies, Apricot-Walnut Lace Cookies, Cranberry Lace Cookies With Lemon Glaze and Lacy Orange Florentines. Good enough to give tip: After the cookies have cooled, sprinkle powdered sugar through a doily to make a pretty pattern. Bonus! Recipe includes 3 tasty twists: Iced Rounds, Rum-Tum Gingerbread and Raisin Gingerbread. Good enough to give tip: Nestle bars in cupcake liners to keep them from sticking. Bonus! Recipe includes 4 tasty twists: Orange Creamsicle Bars, Chocolate-Orange Bars, Lime Bars and Lemon-Raspberry Bars. Good enough to give tip: Line your container with festive wrapping paper to add a dash of holiday cheer. Bonus! Recipe includes 2 tasty twists: Lemon-Drizzled Shortbread and Petticoat Tails. Good enough to give tip: Line the bottom of a jar with parchment paper and cover the lid with festive paper or fabric. Bonus! Recipe includes 2 tasty twists: White Chocolate-Dipped Pumpernickel and Chocolate Chip Pumpernickel. Good enough to give tip: Line a box, tin or bread pan with red-and-white tea towels to add an extra layer of protection for these sweet-and-soft chocolate goodies. Bonus! Recipe includes 4 tasty twists: Mocha Krinkles, Almond Krinkles, Dulce De Leche Sandwiches and Sprinkle Krinkles. Good enough to give tip: Present pizzelles in a pretty floral container to complement their elaborate patterns. Add a handwritten recipe card for the finishing touch. Bonus! Recipe includes 3 tasty twists: Pumpkin-Pie Spiced Pizzelles, Pizzelle Cannoli and Ice Cream Sandwiches. Good enough to give tip: Punch four holes on both sides of each corner on a plain bakery box. Then lace pretty ribbons through the holes to create a gorgeous gift. Bonus! Recipe includes 2 tasty twists: Espresso Wafers and Hazelnut Wafers. Good enough to give tip: Present individual linzer cookies in paper brioche molds (found at baking supply stores). Good enough to give tip: Tie each wreath with a fun ribbon and stack in a narrow, paper-lined box. Good enough to give tip: Wrap a box in pretty paper, nestle the cookies inside, and finish with a coordinating ribbon. Good enough to give tip: Line a vintage tin with old-fashioned doilies. Bonus! Recipe includes 3 tasty twists: Apricot Kipfels, Jam Half-Moons and Cherry Cream Kipfels. This retro recipe is making a Christmas comeback—and it’s an easy one for the kids to make, too. These sweet, light-as-air swirls with a minty twist will add the perfect pop of pretty to your holiday cookie tray. Need Something to Wash These Down?